Like a true mountain runner, Shaun is comfortable with long periods of solitude, but what he lacks in social skills, he makes up for with an abundance of running shoes. Shaun�s accolades are far too many to list in full, beginning with an inspired mid-pack finish at a community cross country race as an 8 year old. It was in the small town of Roberts Creek, nestled between the Salish Sea and the Coastal Mountains that Shaun first discovered mountain running. There was only one way to go, and it was up. 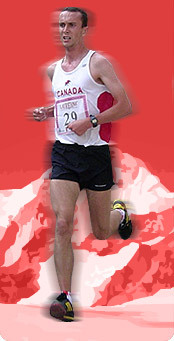 Shaun competed with the Elphinstone Cougar�s in high school. In University, he went on to compete as a Varsity Athlete with the UBC Thunderbirds. During this time he has also been involved with snowshoeing and stair-climbing. He is a multi-time champion of the popular 5peaks trail running series and Yeti snowshoe series and holds the record for fastest ascent up: the Sheraton Wall Center, the Columbia Center in Seattle, as well as many other unofficial climbs at undisclosed buildings across North America. In 2006 Shaun travelled to Turkey as a junior to race at the World Mountain Running Trophy, finishing 41st. In 2014 Shaun returned to the championship to compete as a senior athlete.